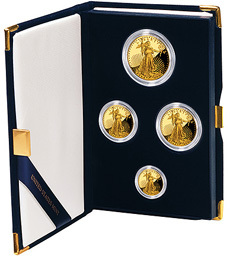 The United States Mint began sales of the 2010 Proof Gold Eagle Coins today October 7, 2010. The 22 karat gold coins are available in four different sizes, along with a four coin set containing one example of each coin. The American Gold Eagle features a classic rendition of Liberty, holding a torch and olive branch with the rays of the rising sun and the U.S. Capitol building behind her. The design originally appeared on the Saint Gaudens Double Eagle, minted from 1907 to 1933. The reverse, which was designed by Miley Busiek, features a male eagle carrying an olive branch to a nest containing a female eagle and hatchlings. Collector versions of the Gold Eagle have not been available since 2008 due to increased demand for gold bullion coins. Under current law, the United States Mint is required to produce American Eagle gold and silver coins in quantities sufficient to meet public demand. During times when demand for bullion coins has exceeded the available supply of precious metals blanks, the Mint has sourced all blanks to the production of bullion coins. As a consequence, collectible uncirculated and proof versions have been canceled or delayed in recent years. During 2009, all collectible versions of the Gold and Silver Eagle were canceled. This year, the 2010 Proof Silver Eagle and 2010 Proof Gold Eagles will be issued, however, the collectible uncirculated versions have been canceled. 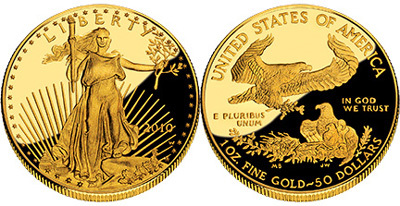 The 2010 Proof Gold Eagles are available in one ounce, one-half ounce, one-quarter ounce, and one-tenth ounce sizes. Individual coins are priced at $1,585.00, $806.00, $415.50, and $180.50, respectively, with the 4 Coin Set is priced at $2,938.00. Prices have been determined based on the average weekly price of gold and may be adjusted as frequently as weekly. Although no ordering limits are imposed for the coins, product limits have been set for individual and four coin set sales. The limits are 25,000 one ounce coins, 15,000 one-half ounce coins, 16,000 one-quarter ounce coins, 27,000 one-tenth ounce coins, and 39,000 four coin sets. Are these considered low mintages for gold proof coins? If they sell the maximum, they would be on the high end. Does it make sense to have the sets graded for 1st strike?